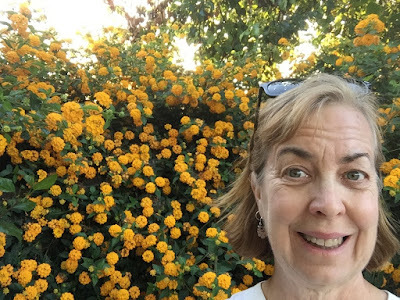 Aprille's SoCal Gardening ✿❀✾: Who Doesn't Like Lantana? I apologize for skipping July here dear readers. It was all I could do to just water my own garden(and work in others). We had the hottest July on record they say. On 7/6 we had blowtorch weather of 114º here at my house. I lost 3 rose bushes and several other plants. The there were so many days in the upper 90s. I can take 90º easily compared to 114º! My new little Michelea champaca tree that replaced out giant Cedar is still trying to recover from burned leaves. Anything that is tropical or has big leaves like Nandina, Raphiolepis, Avocados got burned. I'm still seeing 4' brown tops of Eugenia street trees in South Pasadena. August is usually the killer. I don't like it. Get this summer over with please! But to think on the bright side, every August day we get through is one we don't have to do again and are that closer to Autumn! 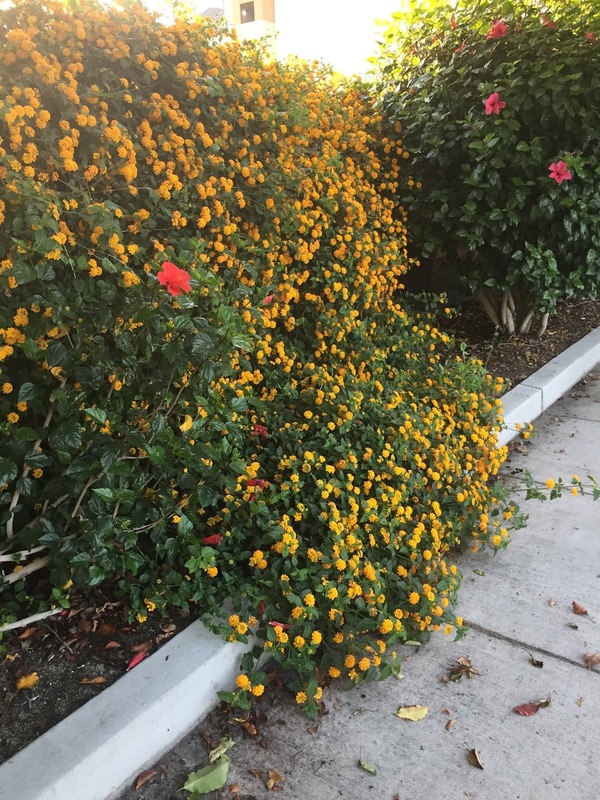 I thought I didn't like Lantana way back when I worked at the nursery. They smell kinda bitter like grapefruit. Then I began working in gardens around them and also smelled a sort of aftertaste fragrance. It starts out bitter then turns sweet like(those tv commercials for) Sour Patch Kids! Lantana are ubiquitous here in the LA area. Why? Because they are easy, fast growing, drought tolerant and bloom for a really long time. Isn't that what everyone wants in a plant? Except for a prolong hard frost, they are mostly indestructible! I've never lost a Lantana to frost here. They usually get just a little frost burned tips. But fast growth also means it may need pruning twice a year if it gets too chummy with plants around it. 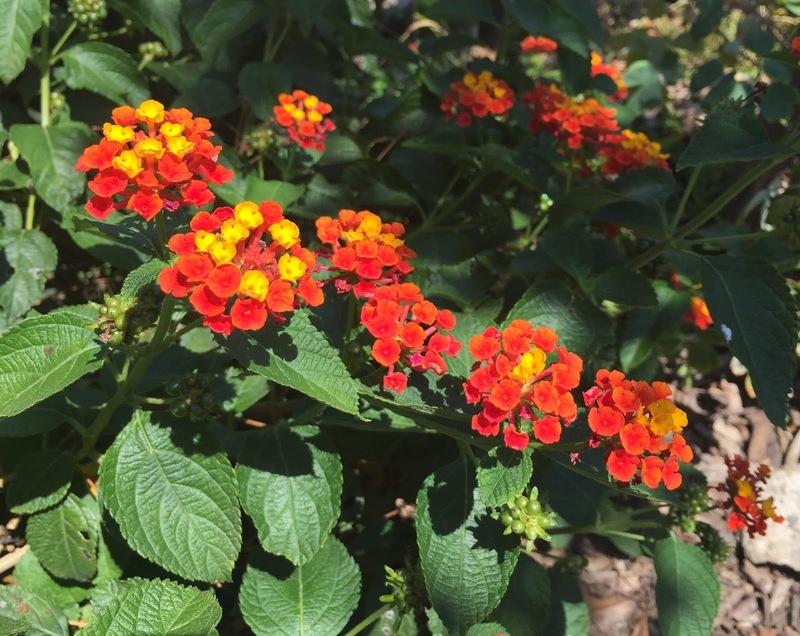 If it grows over another plant, Lantana will block the light and may kill it. So get used to cutting it down. Pruning won't kill it. Oh, I almost forgot- it attracts hummingbird AND butterflies. Research says that they are native to the tropical Americas and Africa. In Australia they are trying to control them from being invasive. 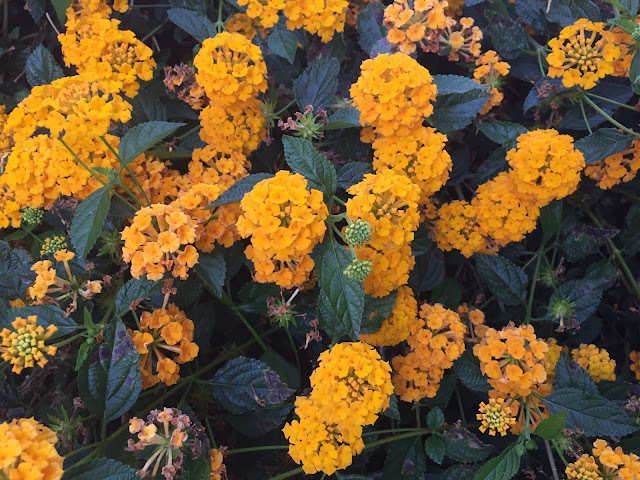 There are many varieties of Lantana, but two basic kinds; trailing are L. montevidensis and upright are L. camara. I grow 4 varieties in my garden right now. a pale pink peachy one in my garden without a tag. Here is a yellow one in my garden spilling out into the street. 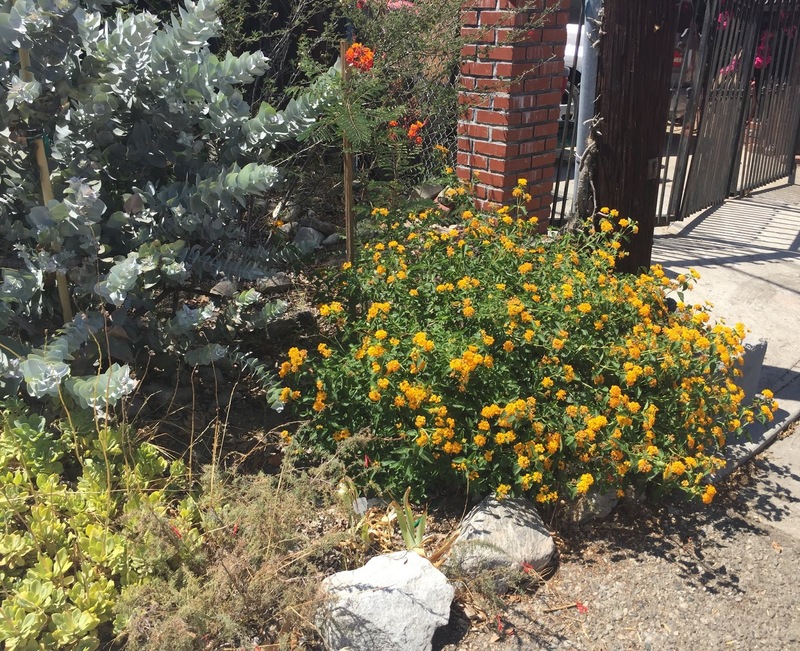 I also grow a pink variety called Lantana "Malibu Beach Cities" that is supposed to be compact growing. But it is taking a break from flowering right now so no pic. On my evening walk I saw this Lantana above growing over an 8' chainlink fence! 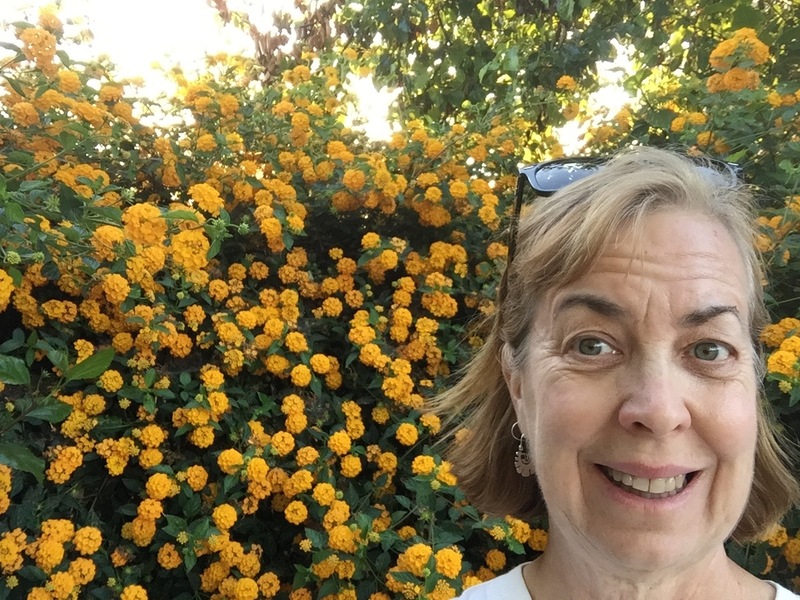 Here I am with it to show how tall that Lantana is! Below please see how much you can cut back Lantana. That twig at the bottom middle left is it. I whacked one of mine here about a week ago. It's still green inside the branches. It'll pop any day now despite the 97º it is outside! Lantana super whacked in my garden. There is something about Lantana that makes my memory keeper go back to my childhood. I can never figure out if it is my Grandma's house (by the garage shower) or at a neighbor's house.Probably both.